Three bones form the knee joint: the femur (thigh bone), the tibia (shin bone), and the patella, which is the kneecap. Ligaments, which are strong cords of fibrous connective tissue, connect the bones and hold them in position as the knee bends and straightens. One of the four main ligaments of the knee is the anterior cruciate ligament (ACL). Together with the posterior cruciate ligament (PCL), it forms an 'X' shape inside the knee joint. The ACL runs from the bottom of the femur at the back of the knee, diagonally through the joint and attaches to the top of the tibia at the front of the knee. It provides stability to the joint by limiting the rotation and forward movement of the tibia underneath the femur. It is very strong but not very flexible. The ligament fibers can be torn by a sudden change of direction, a sudden transference of weight from one leg to the other, as when landing from a jump, a sudden stop, or by straightening the leg beyond the knee's normal range of motion. An injury of this kind is called an ACL tear. You can find braces specifically designed for ACL injuries here. Another of the four main knee ligaments is the medial collateral ligament (MCL). This runs from the bottom of the femur, down the inside of the knee and over the joint to the top of the tibia. Like the ACL, it limits mobility of the knee joint and prevents it opening up too far when pressure is applied to the outside of the knee. Partial or complete tearing of the MCL ligament fibers is known as an MCL sprain. Although it can be injured in isolation, often the ACL is damaged at the same time. The most common cause of an MCL sprain is traumatic force applied to the outer side of the knee, and is an injury often sustained during the playing of contact sports. You can find a brace specifically designed for MCL injuries on this page. 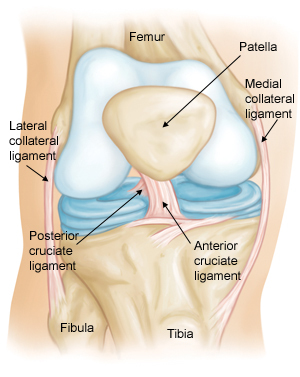 A third main knee ligament is the lateral collateral ligament (LCL). This is a strong narrow rope of ligamentous fibers that connects the femur and the tibia along the outside of the knee joint. It holds the outer surfaces of the joint closely together and limits the sideways movement of the knee. Damage to the ligament fibers of the LCL is known as an LCL tear. Of the four main stabilizing knee ligaments, the LCL is the least likely to be injured. However, an injury to the LCL commonly results in damage to other knee ligaments as well. An LCL sprain is normally caused by strong, direct force applied to the inside of the knee that forces the joint outwards, beyond its normal range of motion. Less commonly, a sudden, twisting motion can also tear the ligament. Athletes playing football, soccer or engaging in wrestling are more susceptible to LCL injuries. For an overview of all the braces available here at MMAR Medical for these types of knee injuries, click here.